It’s done. 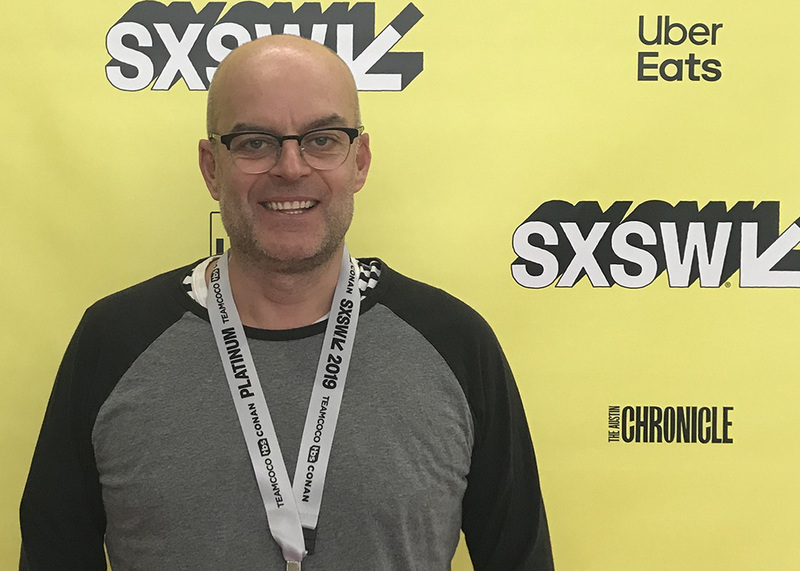 My SXSW odyssey is complete; seven days of marketing, film, music, robots, psychology, VR, entertainment, tacos, politics, tech, weak coffee, AI, AI, AI, AI and more AI. I’ve got a brain jam-packed with stuff and I’m suffering from innovation overload. The challenge now is to disseminate it all and make use of it on the other side of the Pacific. But I’ll leave that for the flight home. During the first few days of my time at SXSW, I mostly sought out the big name keynote speakers, getting inspired by the likes of AOC and Brené Brown. But for the second half I consciously de-coupled from Gwyneth Paltrow, missed Jodie Foster and didn’t show up for The Fonz’s acting masterclass (big FOMO after that one). I wanted to seek out sessions from less well-known speakers (to me anyway), hoping for a little less hype and more detail. Here’s a whistle-stop tour. First up was a very humbling speech by Susan Foster, the lady responsible for blowing the whistle on Uber’s toxic culture in 2016, causing the downfall of its senior leaders. She single-handedly burst the bubble of Silicon Valley with one 3,000-word blog post. Her exposé of the aggressive and destructive culture she experienced at this seemingly progressive company was sobering to say the least. She stated that if your workforce is racially diverse, you have industry-leading inclusion policies and you have women on your board and in positions of power (Uber had all of this and more), none of it matters if you are still discriminating against people. Roger McNmee, an early investor in Facebook but now a very outspoken critic of the company’s impact on society and democracy, was spruiking his book, Zucked. McNmee advises both sides of US politics on social media and privacy, including Elizabeth Warren, whom he agrees with regarding the proposed breaking up of Google, Amazon and Facebook. He can’t see why we need behavior modification through social media in our lives and finds it troubling how organisations can sell our data without our consent. He pointed out that the only organisation ring-fencing your personal data is Apple; if you’re an Android user you are basically handing your data to everyone. With the lack of trust emanating from consumers across the globe, it’s a competitive advantage for Apple. BTW – Roger is still using Facebook to market his new book. Continuing on the topic of trust, author Neil Pasricha spoke about how we are experiencing the lowest levels of trust than at any time throughout our history. He used three terms to explain his perspective: ‘Finite vs infinite’ – with the infinite choice available to us it naturally makes us less trusting. As humans we apparently trust finite things, we prefer things that have a specific end to them. The next was ‘Human over Algorithm’, in an era of bots, we are more likely to trust the human brain. And finally, ‘Go all in, show all in’, he believes organisations should pick one thing and do it well. We apparently trust the specialist more than the generalist. Not sure I agree with his opinion, but it definitely got me thinking about the organisations I trust more, and why. Best-selling author Erica Kerswin is apparently an expert in ‘working human’. She shared some interesting facts about helping people feel happier at work. According to The New York Times, 45% of people in the states have no one to talk to about how they are feeling and the effect of loneliness on our health equates to smoking 15 cigarettes a day. But if you have a best friend at work (people you talk to about non-work-related things,) you are less likely to leave and you’ll be more productive. People want purpose and meaning at work, which is associated with Millennials and Gen Z, but according to Erica it increases with age. Makes sense to me. Digital assistants and ‘voice’ in general were hot topics at SXSW and it was on my list from the start. At The Brand Agency, we’re thinking a lot about voice as a channel for our clients; what it means to their brand and its utility to their customers. Cathy Pearl, Head of Conversation Design Outreach at Google spoke about the democratization of voice and its inclusive design for people who are disabled or suffer illness. She highlighted brilliant products such as Voiceitt, for people with non-standard speech patterns such as stutters, and AlterEgo, a project by MIT Media Lab that helps people vocalise using neuromuscular signals triggered by internal verbalizations. You wear a little device under your chin that picks up these signals. It’s perfect for people who can’t be heard by digital assistants and for when we are in private environments. Voice is a huge opportunity and a challenge for every business. By the end of SXSW I felt like getting an ‘I love AI’ rather than a ‘I love Austin’ t-shirt. It seemed like every session I went to, even if it wasn’t billed as specifically about AI had an AI element to it. I could have made this little write up all about AI, but instead, let me summarise. AI is the future, the present, the past, the end of the human race, that start of a bright new dawn, the end of all jobs, the creator of many more, relevant to every task and the solution to every problem, but humans are still more trustworthy and accurate…. in some ways. Of course I jest. AI is a fascinating topic and I soaked up everything I heard and experienced. It has huge ramifications for our industry, our clients and creates lots of opportunity. 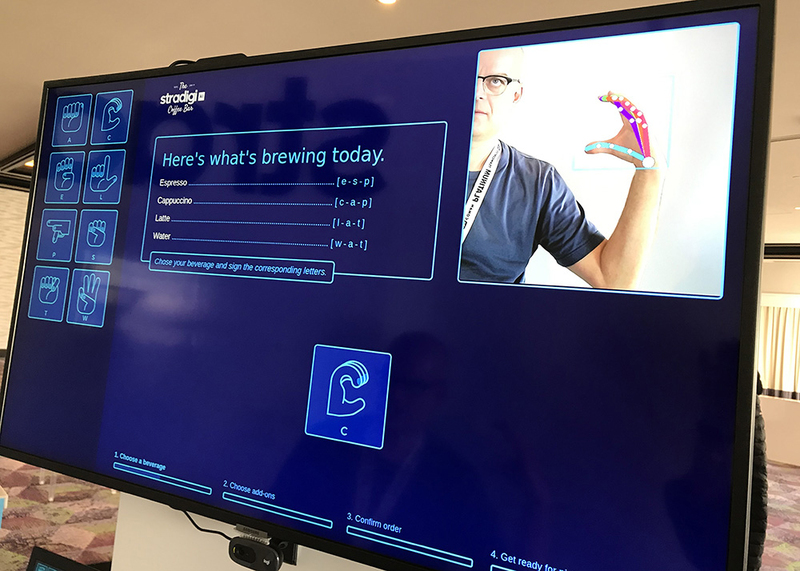 But rather than go into detail, here’s a pic of me ordering a coffee with sign language using AI. See, it can be used for everything. And then it came to my last session. Ok, I lied. I couldn’t resist one last ‘big name’. Step up David Byrne – Mr Talking Heads. In an attempt to counter the constantly terrible news we see in the media about how stuffed our world is, he has created Reasons to be Cheerful, a website and lecture series featuring good news stories, enabling the reader to be optimistic about the future of humanity. He says that we need to keep looking for solutions, because good ideas work. And I think that sums up SXSW perfectly, thanks David.